The Rotovac 360i is a Patented Rotary Jet Extractor that utilizes rotary vacuum heads to thoroughly deep clean carpet with hundreds of multi-directional cleaning passes. In fact, the world's largest carpet manufacturer, Shaw Industries Group, states "Research indicates that the hot water extraction system provides the best capability for cleaning." Since 2010, Healthy Green Carpet Clean has been cleaning carpet via hot water extraction per manufacturer recommendation. Most carpet cleaners today still use the old manual scrub or a buffer systems as can be seen in the image. These methods are antiquated and do little to sanitize or properly clean. 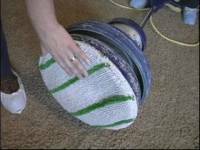 buffers can dry carpets in 30 minutes with very little cleaning action. They srpead dirt and grim around making thinks look "cleaner" and old school wands leave carpet extremely wet while driving dirt and germs deeper into the carpet and padding. Without proper extraction stains tend to come back soon after the carptes are cleaned.